Kevia Bolds had been trying to contact her brother, Rudolph Bolds, for hours. AT&T’s service was down, and floodwaters caused by days of heavy rain in south central Louisiana began to rise. She needed to act quickly before the waters became too difficult to navigate. All she could think about was getting her family to safety, especially her 8-year-old daughter, who had never experienced anything like this. Using the iMessage application on her iPhone, Kevia Bolds was able to contact a friend through the area’s Wi-Fi connection. Her friend reached out to Rudolph Bolds, who couldn’t believe how the catastrophic events were unfolding eerily similar to those of Hurricane Katrina, a storm that devastated the Gulf Coast 10 years ago. For Kevia, Rudolph and the rest of the Bolds family, this is the second time they would most likely lose their most prized possessions and memories, having to rebuild after assessing the damage. It was the second time they were going to need rescuing. Rudolph Bolds didn’t worry much about things that would be lost in the storm. Instead, he needed to find a way to get to his family. Nearly two weeks later, there are still areas of southwest and south central Louisiana sitting in floodwaters, and other areas that have not yet completely drained. The heavy rains that poured over Baton Rouge dumped more than 20 inches of water within 72 hours, leaving 13 dead and more than 60,000 homes damaged and at least 40,000 residents displaced. In certain areas of Baton Rouge, the floodwaters receded quickly, allowing residents to return to their property and figure out their paths to recovery. As Kevia Bolds watched her house being gutted of water-soaked flooring, baseboards and Sheetrock, Rudolph Bolds recalled the mission and difficulties he faced while trying to rescue his family. In August 2005, Rudolph Bolds and many other New Orleanians decided to ride out the storm, just as they had done for many other hurricanes that blew through the city. Rudolph Bolds reassured his father that he would be fine. He needed to stay to fend off looters who may have tried to occupy the empty home. As he watched the news, he realized the water was rising faster than he had anticipated. He went upstairs to remove protective bars from the home’s windows just in case he had to escape later. Once he returned back downstairs, the water was already to his ankles, and it had not begun to rain. The only thing Bolds could do was try to formulate a quick escape route as waters rose from his knees to his waist. After grabbing his German shepherd and running upstairs, Bolds looked back and noticed the entire lower level had already been swallowed by floodwaters. He headed to the attic and phoned his family while he still had cellphone service. 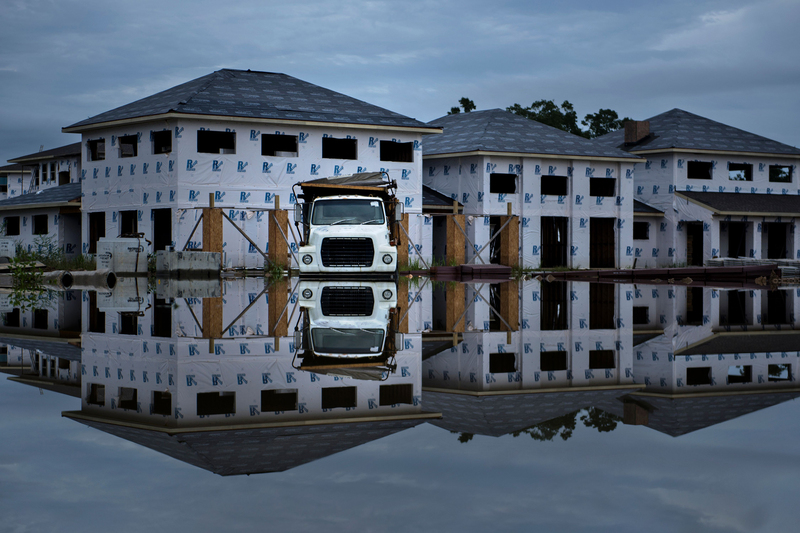 A dump truck is seen stranded in a flooded construction site Aug. 16 in Prairieville, Louisiana. Once the rain ended, Bolds fought strong currents to swim to the top of the roof with his dog, where he realized he wasn’t the only one who had stayed behind. He escaped his home with only his dog and two bottles of water, and waited for two days on his rooftop before being rescued by boat. Bolds spent most of his time after being rescued looking for food, water, and places to wash up and sleep until hitching a ride to Baton Rouge days later. Deciding that he didn’t want family members to suffer through the terrifying ordeal he went through, Bolds, who now resides back in New Orleans, hopped into his vehicle and headed to Baton Rouge. Since many exits were blocked, Bolds took alternative routes to avoid flooded streets. Bolds paddled the motorless boat using a stick and a shovel. After reaching his family, he helped load his mother, sister, niece and daughter into the boat as he swam behind it. One neighbor offered to give the family a ride in his boat and they all headed to dry land. Bolds made sure his family was safe before heading back into the water with two canoes to get his father, who was hesitant to leave out of fear of vandals breaking into his home. Once safe, the reality of the situation began to sink in for Kevia Bolds, who had also lost everything in Hurricane Katrina. She sighed into the phone. Since most of the areas affected during the floods in Louisiana were typically marked no-flood zones, only a low percentage of businesses and residents were insured. According to NOLA.com, only 16,311 of the 137,616 homes in Baton Rouge were covered. Emergency shelters in Baton Rouge and surrounding areas are still housing thousands. Baton Rouge residents Shevette Davis and Nicole Walker were affected by the storm, but have spent their days at shelters assisting others who were affected by the flood. “We do a prayer every morning,” said Davis, who’s housing five displaced residents in her apartment. “Throughout the day, I just walk around and talk and pray with the people that lost everything, especially the elderly people. 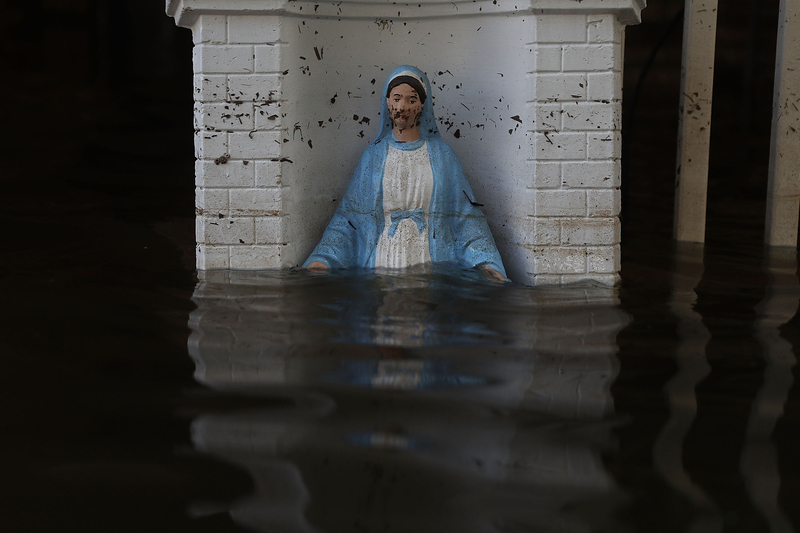 A Virgin Mary statue is seen in front of a flooded home on Aug. 18 in St Amant, Louisiana. Last week Louisiana was overwhelmed by flooding, causing at least 13 deaths and leaving thousands of homes damaged. Walker, who’s also housing a co-worker’s family, knows that as devastating as the situation is, it could have been worse. As she salvaged what she could from her home, Walker continued to use the way the community has rallied around each other as one of the positive examples in such a dark moment. “It puts my situation into perspective,” Walker said. “I’m working at the shelters where people have nobody coming to take care of them. They have no place to go. The majority of people who got flooded didn’t have flood insurance, and it’s just wiped out a whole community. Walker is also thankful for the swift response and assistance from the government.